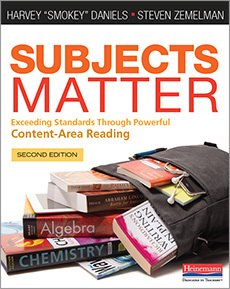 A Guide to Content-Area Reading demonstrates how teachers of all students can engage and support students' reading, support comprehension, and match instruction to students' needs. In addition, participants explore techniques for selecting a balanced diet of texts that invite students into literate practices and hold their interest. Daniels and Zemelman's A Guide to Content-Area Reading shows teachers in every discipline how to energize learning by giving students tools for considering the important ideas in each subject. Its practical activities go beyond the textbook and encourage student cooperation while ensuring kids read and succeed in every classroom. Consider pairing this seminar with the Content-Area Writing course for maximum effect.